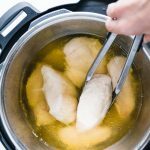 Easy, oil-free recipe for cooking chicken breast in your Instant Pot! This Instant Pot Chicken Breast recipe has only 3-ingredients – making it perfect for making a lot of protein at one time! Perfect to use in salads, stir fries, and macro bowls! ADD INGREDIENTS TO POT: Layer in the chicken breasts, sprinkle with salt, and then pour enough broth to just cover the chicken (for me this is anywhere between 3 and 4 cups, depending on the size of the chicken breasts). PRESSURE COOK: Lock the lid into place, make sure the knob is set to “sealing”, and set to Pressure Cook on High for 11 minutes. May take up to 20 minutes to reach pressure. When the cooking time has finished, make sure the cooker is turned off (and not to keep warm). You can opt to do a quick release or 10 min natural release – I’ve done both and the chicken comes out great either way.